Who pulled whose plug? And notice that Petrofac’s share prices went up. Petrofac shares popped today after the oilfield services provider scrapped a contract with Malaysia’s state-owned oil firm. 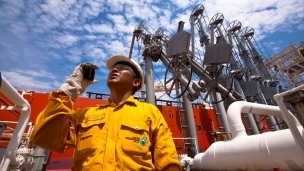 Petrofac’s Malaysian subsidiary and its partners agreed an early stoppage to the development of the the Berantai gas field, located about 150km offshore Peninsular Malaysia, with Petronas. Petronas was due to pay Petrofac $357m (£275.4m) for the contract last year, which resulted in a profit of just $1m during this period. The London-listed firm had the right to end it ahead of the expected end date in 2020, depending on the project’s economics. Title says O&G player, article focuses on bashing RNZ Petrofac. First, there must have been a whistleblower (good play, sir). Second, follow the money trail, which companies and Da… individuals make money out of this revelation? Third, will they pay my invoices? At press time, calls went unanswered… huh, do you know that RNZ offices are closed Friday afternoon? Industry players are starting to feel the impact of the drop in global crude oil prices, which led oil and gas giant Petroliam Nasional Bhd (Petronas) to defer capital expenditure and reduce operational spending. One such player, Petrofac-RNZ, has implemented a voluntary separation scheme (VSS) for its employees based in its Kuala Lumpur head office, sources say. The VSS was offered last month to its permanent employees based in its Kuala Lumpur head office with Job Grade 19 and below only. Petrofac-RNZ also has offices in Sabah and Sarawak. Petrofac-RNZ is a member of Petrofac Group. It provides engineering and consulting services to the offshore oil and gas sector, including oilfield services to the international oil and gas industry. A check on its website showed that a big portion of its jobs in Malaysia were for Petronas’ exploration and production arm, Petronas Carigali Sdn Bhd. Worth more than USD 500m, the competitively tendered lump-sum EPCC scope of work includes three sulphur recovery units, two amine regeneration units, two sour water stripping units, a liquid sulphur storage units and a sulphur solidification package unit. Barclays natural resource investments (BNRI), a division of Barclays Capital, has invested in a Southeast Asia-focused oil and gas development company Nio Petroleum. Nio Petroleum is an oil and gas development and production company established in 2009, with a primary focus on offshore assets in the Asia-Pacific region, particularly Malaysia, Thailand, Vietnam, Indonesia and Australia. It seeks out undeveloped discoveries, marginal fields and late-life assets in Southeast Asia, which it will add value to through the innovative use of existing and new technologies and commercial know-how, Barclays Capital and Nio Petroleum said in a joint press release yesterday. Nio Petroleum is founded and managed by Richard Hall and Rory Edwards, a duo with a track record in oil and gas development, derived from working with national and independent oil and service companies over the past 25 years. Their experience includes schemes in the North Sea and offshore Southeast Asia, which have enabled the monetisation of small fields or extended the life of mature fields. …Nio Petroleum Limited (Nio) is working in the Asia Pacific region. Nio’s primary focus is offshore assets in the Asia Pacific region, particularly Malaysia, Thailand, Vietnam, Indonesia and Australia. In May 2010, Nio acquired Blocks SB307 and SB308 offshore Sabah in Malaysia in conjunction with Lundin Petroleum and PETRONAS Carigali. PETRONAS today awarded Blocks SB307 and SB308 offshore Sabah under a single Production Sharing Contract (PSC) to a partnership comprising Lundin Malaysia B.V., Nio Petroleum Ltd., and PETRONAS Carigali Sdn Bhd. Blocks SB307 and SB308 measure approximately 6,230 sq km and is located in water depths of up to 70 metres. Both blocks have been explored since 1965 and have led to the discovery of the producing Barton, South Furious and St. Joseph fields, currently operated by Sabah Shell Petroleum Company Ltd under a different PSC. Nio Petroleum Limited offers oil and gas development and production services in Malaysia, Thailand, Vietnam, Indonesia, and Australia. Nio Petroleum Limited was incorporated in 2009 and is based in London, United Kingdom. Nio Petroleum (Sabah), set up by two former managers at oil services and production firm Petrofac, is being bought by EnQuest, based in Aberdeen. The firm was set up in 2010 by Richard Hall, who previously worked with Norwich-based Acteon before moving to Petrofac, and Rory Edwards, also previously at Petrofac. It said its niche was opening up dormant discoveries and redeveloping mature, previously developed fields and was working in partnership with Malaysian state firm Petronas and Sweden’s Lundin on two blocks of the coast of Sabah, Borneo. As of November 9, 2012, Nio Petroleum (Sabah) Limited operates as a subsidiary of EnQuest PLC. The recently concluded Offshore Technology Conference Asia 2014 (OTCA) showed strong interest from major oil and gas (O&G) players towards investing in Malaysia. RHB Research in a research note today said among the players were UK-based Petrofac Ltd, Talisman Malaysia Ltd, Murphy Sarawak Oil Co Ltd and Shell Malaysia. The research house said Talisman Malaysia which was granted a progressive volume based (PVB) production-sharing contract (PSC) for its Kinabalu oil fields, wants to boost the improved oil recovery potential and reap synergies from the Samarang project, off Sabah. The oil company is also looking at extension acreage for its SB309/310 field, off Sabah, with three to four well exploration programmes this year and boost the recovery rate of its 41 per cent-operated Block PM3 CAA, offshore Peninsular Malaysia to 40 per cent from 30 per cent, it added. Happy ‘renew your BEM and IEM registration’ week (don’t forget that offshore bank account). I see Petrofac is looking for a development manager, engineering manager, tech assistant, operation support engineer, senior maintenance engineer, company site representative (CSR). Send your CVto petrofac.com → Career → Job Search → Location → Malaysia. Not an engineering job, but I see ConocoPhillips has an opening for an office administrator. I guess they are going to open an office in KL? I’m looking for a senior process engineer, 7+ years experience. Send your cv here. Also looking for technical safety persons, metering / measurement engineers and other seniors you think will catch my eye. Help me (and you) increase my cloud presence. Pleease use some form of cloud storage, so if you lose your laptop with those oh-so-important reports, be assured that (with Internet access) the files are still accessible. Use my referrals for Dropbox, MiMedia, SpiderOak, MediaFire, Ubuntu One, Sugar Sync. The IEM has a coffee table book out, Engineering Heritage of Malaysia (no, it is not Datuk Seri Samy Vellu’s bio). Visit here for details. Food?I had lunch at Chakri Palace, KLCC. Blooming expensive. Anyone want to treat me to dinner there? Oil and gas services provider Petrofac is to operate and manage two training facilities for Malaysian oil major Petronas in a contract worth 120m dollars. The company is currently constructing two upstream plant training facilities and a downstream facility to support Petronas’ workforce capability enhancement programme. The two upstream facilities will be managed by Petrofac for the next five years and will see 500 delegates trained each year. There is the option to extend the agreement for a further two years. Andy Inglis, the head of Petrofac Integrated Energy Services, said he was ‘delighted’ to build on the existing relationship with long-term customer Petronas.